Max. Hole: Ø16, 17, 18.5mm. • Indexable insert spotting drill holders for 100°/120°/142° spotting. 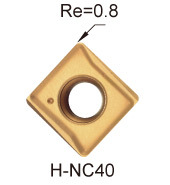 • Spotting produces better hole position and geometrically uniform holes. • Increase tool life of the next drilling operation. • Applications : spotting and chamfering on milling machine, machining centers. 99616-3/4-120 N9MT11T3CT2T 120° 3/4" 100 0.669" 0.187"
99616-3/4-142 N9MT11T3CT2T 142° 3/4" 100 0.728" 0.124"
H-NC40 : K20F grade, for unhardened steel & cast iron. 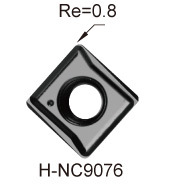 H-NC9076 : K20F grade, for non-ferrous material.